DURHAM, N.C. — Glioblastoma brain tumors can have an unusual effect on the body's immune system, often causing a dramatic drop in the number of circulating T-cells that help drive the body's defenses. 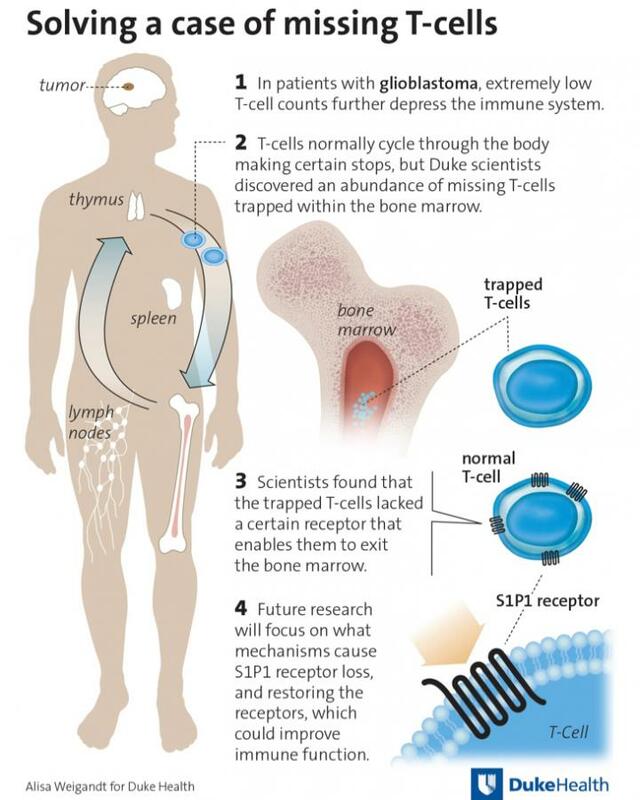 Where the T-cells go has been unclear, even as immunotherapies are increasingly employed to stimulate the body's natural ability to fight invasive tumors. "Part of the problem with all these immunotherapies — particularly for glioblastoma and other tumors that have spread to the brain — is that the immune system is shot," said lead author Peter E. Fecci, M.D., Ph.D., director of the Brain Tumor Immunotherapy Program in Duke's Department of Neurosurgery. "If the goal is to activate the T-cells and the T-cells aren't there, you're simply delivering therapy into a black hole." Where most people have a CD-4 "helper" T-cell count upwards of 700-1,000, a substantial proportion of untreated glioblastoma patients have counts of 200 or less, marking poor immune function that makes them susceptible to all manner of infections and potentially to progression of their cancer. "It's totally bizarre – this is not seen in any disease state," Fecci said. "This appears to be a mechanism that the brain possesses for keeping T-cells out, but it's being usurped by tumors to limit the immune system's ability to attack them." "Interestingly, when we restore this receptor to T-cells in mice, the T-cells leave the bone marrow and travel to the tumor, so we know this process is reversible," Fecci said. His team is collaborating with Duke scientist Robert Lefkowitz, M.D., whose 2012 Nobel Prize in Chemistry honored discovery of the class of receptors to which S1P1 belongs. They are working to develop molecules that would restore the receptors on the cells' surface. "We are hopeful that this finding provides a missing element that would enable more immunotherapies to be effective for more people," Fecci said. He said the finding could also work in reverse, offering a new approach to quell auto-immune disorders by activating the T-cell sequestration.